The UK has approved more than £5bn worth of arms export licenses to countries listed as being of “human rights concern” by the Foreign & Commonwealth Office, including Saudi Arabia, Libya, Syria, Ukraine and surprisingly...sanctioned Russia. The annual report by the Committees on Arms Export Controls (CAEC) said that the government granted 28 states a total of 3,298 export licenses, valued at £5.2 billion. The CAEC urged London to be “significantly more cautious” handing out licenses. “The Government would do well to acknowledge that there is an inherent conflict between strongly promoting arms exports to authoritarian regimes whilst strongly criticizing their lack of human rights at the same time,” the report reads. CAEC also accused the government of undertaking an effort to “reduce the transparency” of arms exports by allowing manufacturers to trade under a stealth licensing scheme that keeps the value of the sold goods hidden from the public. 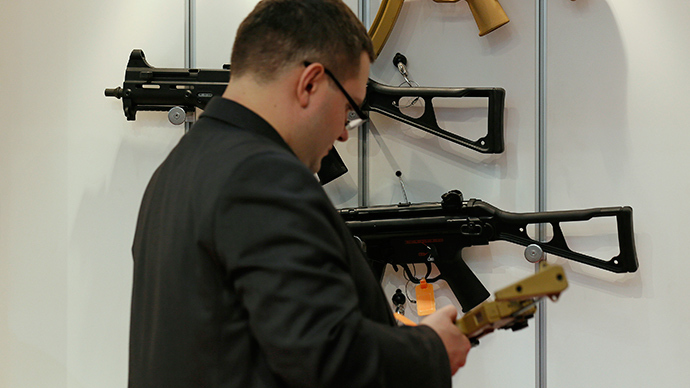 Arms exporters tend to avoid seeking Standard Individual Export Licenses (SIELs). Instead the report argues, manufacturers are encouraged to obtain Open Individual Export Licenses (OIELs), which allow for an unlimited number of sales over a five year period. With regards to Ukraine, the committees recommends that the government explain the reasons for approving its export licenses for “non-lethal goods” like body armor, command communications control and intelligence software, and other military use technology. “The committees recommend that the Government states in its Response what is now its policy on the export of military and dual-use goods to Ukraine, and on the extant export licences to Ukraine for both categories of goods,” the report reads. In addition to Ukraine, the report wonders how – under internationally enforced sanctions – London could have approved the sale of military helicopters, cryptographic software and small arms ammunition to Russia. In particular the report highlights concerns about how Britain has approved export licenses to Libya for equipment such as anti-riot shields, assault rifles shotguns, hand grenades, body armor, and to Syria for body armor, military helmets and cryptographic software. The British government has also been asked to justify the sale of “components for military electronic equipment” to Iran and anti-riot shields and assault rifles among other things to Saudi Arabia. Other countries of concern include Yemen, Uzbekistan, Bahrain, and Tunisia.